Divers bring sea creatures from the deep up for a visit with their land-dwelling fans. For many people it is amazing to see what lives under the surface just a few metres from where they walk. In this popular signature MLSS program, a dive team brings a fascinating local collection of marine life specimens such as crabs, sea stars, and nudibranchs up from the subtidal waters adjacent to the event. 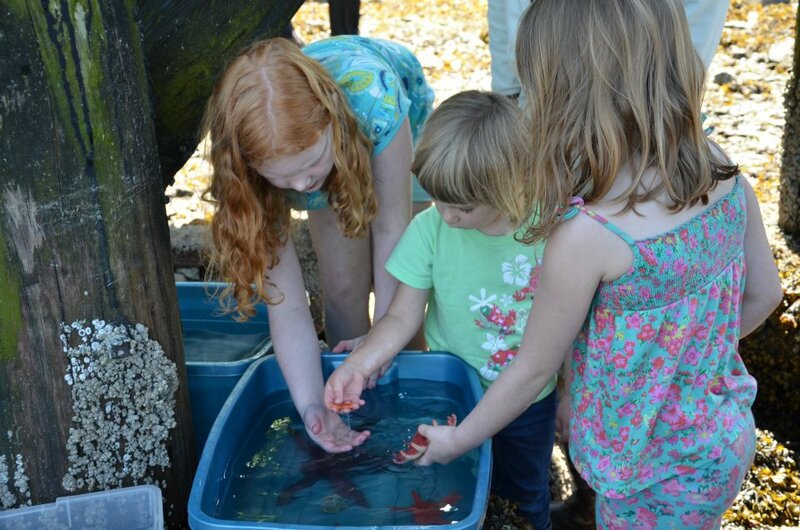 While the animals are cared for in our mobile sea water tanks, members of the public enjoy supervised hands-on interactions with these beautiful and fascinating organisms. An MLSS team of biologists and educators is on hand to answer questions and care for these creatures until their gentle return to the deep. 2017 Pender Island Photo Gallery. A big thank you to the Pacific Salmon Foundation for their contribution to our Beach Interpretation Program. Thank you as well to the RBC Blue Water Project for their generous grant supporting this initiative.